The rules engine lets you create custom rules for importing, categorizing, and combining findings from different plugins. With the rules engine you can tag incoming findings, replace the body text of findings with an entry from your IssueLibrary, de-duplicate findings coming in from multiple scanners, and much more. Set up custom triggers so that these actions are applied when and where you need them. If you haven't done so already, now would be a good time to review the Upload and work with tool output page of the Working with projects guide for more details on how the Plugin Manager, the Rules Engine, and your custom report template work together when you add tool output to your Dradis project. What should trigger this rule? Think of this section as the IF part of the classic if/then statement. The trigger determines when or if the action (described more in the next section) will be applied. If you're dealing with multiple triggers, make sure to toggle the If ___ these statements apply selector to choose whether the trigger should occur when either all or any of the statements apply. What actions should be performed? If the trigger is the IF, the action is the THEN counterpart of the classic if/then statement. The trigger is the cause, the actions are the effect. 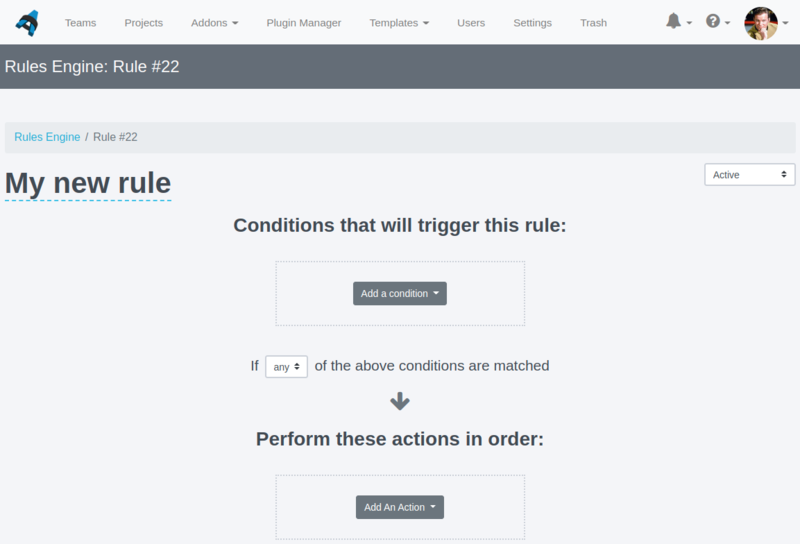 After establishing your triggers, it's time to outline what you want the Rules Engine to do every time that trigger condition is met.